DETUCK(TM Loud Whistle Stainless Steel Emergency Whistle Double Tubes Survival Whistle With Carabiner and Lanyard for Camping,Hiking,Outdoors,Sports Referee,Dog Training etc. by DETUCK at Kerinci. MPN: WS-02-S. Hurry! Limited time offer. Offer valid only while supplies last. 1,LOUD WHISTLE. Double tubes loud whistle can be easily heard over a long distance. 2,COMPACT&LIGHTWEIGHT. 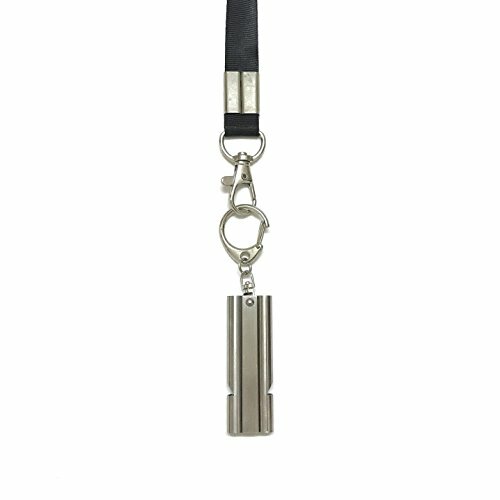 Compact whistle Length 2.2inch×Width 0.8inch×Height 0.3inch(56mm×19mm×7mm),lightweight 1 ounce. 3,DURABLE WHISTLE. High quality stainless steel material,waterproof,unbreakable,very strong and durable. 4,CONVENIENT AND PRACTICAL. Suit for emergencies,camping,hiking,outdoors,sports referee,dog training etc. 5,BEST AFTER-SALES SERVICE. Quickly response and 100% money back guarantee if not satisfy with product.